A large number of people have begun to enjoy tra-ditional Chinese cooking, making it one of the most popular cuisines in the world. This cuisine strives for balance, both nutritive and aesthetic. 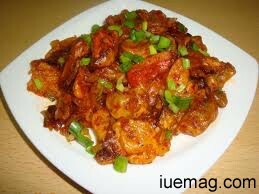 It is one of my favorite cuisines as it is pleasing to the eye and also a fragrant combination of flavors and textures. For starters here's my personal favorite. In a bowl, combine all the ingredients except the vegetables and add enough water to make a thick batter. Dip the vegetable strips in the batter and deep fry in hot oil till they are golden brown. Drain on absorbent paper and keep aside. Heat the oil, add the finely chopped garlic, sauté over a low flame till the garlic turns golden brown. Add the spring onion whites, soya sauce, tomato ketchup, vinegar & salt and stir fry tor 1 minute. Add the crispy fried vegetables and toss lightly. Serve immediately with schezwan sauce.